Carrots have figured rather heavily in my diet as of late. You see, we reside atop a small supermarket and whilst we refuse to shop there for most items, they frequently reduce items that are going out of date – very frugal. Of course, the food they reduce is never actually past its best, let alone going off, so we consider it best to minimise waste wherever possible. 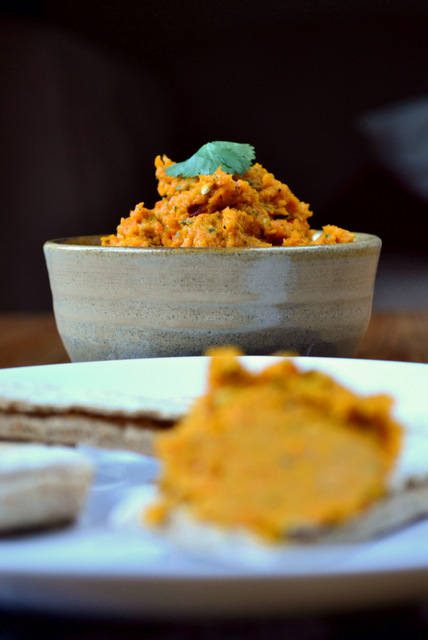 It just so happens that we’ve recently encountered a spate of reduced carrots, an occurrence which has both enabled me to further my experimentation, resulting in this rather special Carrot and Coriander Hummus. This recipe has quickly become one of my firm favourites. It is adapted from an idea given to me by Hugh Fearnley-Whittingstall. 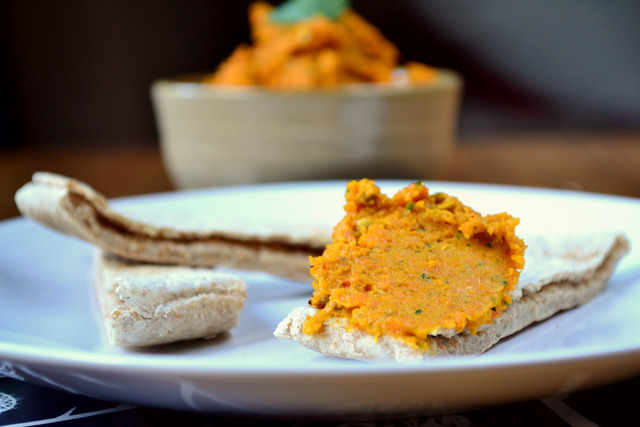 In my eyes, carrot hummus is just as delicious as regular hummus – there’s just something about roasted carrots that get my taste buds going. Indeed, the sweetness of the carrot and the slight caramelisation of its natural sugars through the process of roasting expertly succeeded in captivating my senses. If you’re at all interested in reading my other recipes that make use of the carrot and coriander combination, click for my carrot and coriander soup and carrot and coriander fritters! 1. Pop the carrots and garlic cloves onto a roasting tin, drizzle with oil, season and roast for 20-30 minutes – until just beginning to brown. 2. Toast the coriander seeds before bashing them up a bit. Squeeze the roasted garlic out of their skins. Transfer everything to a food processor, adding the olive oil 1 tbsp at a time until you’ve achieved the desired consistency. Serve with pita breads. Cost: My carrots cost 10 pence a bag, which is incredible. However, I have to assume that yours didn’t – in light of that assumption my estimate for this hummus would be £1.30, which, as it happens, is exactly the same price as the original recipe! Not only am I frugal, my frugality is consistent! Thanks! No problem at all! Oh yummy! Beautiful pictures too! Reminds me I haven’t made Hummus in a while, and yours sounds and looks fantastic! This sounds and looks amazing!! Totally having a go at this! Thanks! Please do, and make sure you report back! Looks lovely. If you like variations of hummus, I reccomend using beetroot, lovely! I like it! Bur can I exclude peanut butter? You could… but it;s not advisable! This looks delicious. Must try! Oh, that combination of carrots, coriander, peanut butter and lime! Sounds absolutely delightful! That looks really delicious, can’t wait to try out the recipe. Frugal, this is such an intriguing recipe. Very inventive! I should also mention that I am loving all of your photos. They always make me want to reach out and grab the food…too bad I’m looking at your creations on a computer. I love the color – would be great for an appetizer buffet…. It would – it has a certain wow factor! Oh absolutely – very intriguing, but totally worth it! That sounds amazing and is gorgeous:) THanks for sharing! Thanks so much – no problem, of course! Another great carrot recipe. I am grateful because my farm share keeps giving me 8 pound bags of carrots. Thanks so much 🙂 Oh wow… don’t turn orange! As with most things you’ve made lately this hummus is a gorgeous color. Yay for on sale carrots! This sounds awesome! I love finding new hummus ideas and recipes and this one will be next on our list! I hope you like it – though I know you will. What an excellent idea – I have really been missing my hummus since starting the Low FODMAP diet – your recipe (minus the garlic!) is just the ticket. Thank you for blogging about it, I will surely give it a go. Thanks! This will suit you down to the ground – there are always viable alternatives! Thanks, Cecilia! Please do, it really is yum! Oh, this IS a good idea, thanks Nick! I love hommus, and dips are great at this time of year when there’s lot of entertaining to do! Thanks, Celia! This is the perfect dip for you then! Looks beautiful as always! 🙂 I’m going to have to give it a try! Thanks so much – please do, you’ll love it! Thanks so much 😀 Please do – you won’t regret it! Interesting recipe and great photos! Hehe, thanks, Spree! NO, you can get it anywhere here! I think my kids would go for this recipe–peanut butter, orange, served on pita bread, and for me, not expensive. What a great recipe. I forgot to add. Great photographs! Thanks! Of course, that was just me being difficult :D.
They work VERY well together! Awesome 😀 – I quite agree. Make it, you’ll not regret it! This sounds surprisingly good! I say “surprisingly” because I couldn’t quite come to terms with ‘carrot’ and ‘hummus’ in the same recipe title. Having read it, though, I’m a convert! Haha – you should try it… it’ll blow your mind! Thanks so much 🙂 I’m glad you think so! I bet the dollop of your homemade peanut butter added greatly to the depth of flavor in this hummus. Yummus! OH absolutely – it had so much flavour! i like this idea very much. i’ve gone off regular hummus because i’ve eaten so much of it lately, so this is the perfect antidote. thanks for the recipe! Thanks so much 🙂 – yes, I think you’ll prefer it too! This looks amazingly delicious!!! Definitely gonna try it our soon!!! Please do – you’ll love it! Frugal, now don’t get too orange, you might start looking like an oompaloompa…. I’m loving this carrot series, especially with the coriander. I love putting peanut or almond butter in my hummus when I’m out of tahini, fancy seeing it here! I can see how this would be infinitely more interesting than mere chickpea hummus. Nice! Haha – I’ll try not to! More carrot soon perhaps… we’re brewing a carrot risotto! Definitely more interesting! Love the idea of adding peanut butter — I’ll definitely try this! Yes, it gave it so much flavour! Yay! Haha – please do! IT works very well! Hmm.. this looks so so delicious! Really have to try this one! I’m putting this page on my faves! Thanks 😛 – awesome, enjoy! This does sounds quite fantastic! I love using different nut/seed butters in my hummus like spreads. I recently made a version using lentils, sunflower seed butter, and curry powder that turned out quite wonderfully. Thanks so much! IT works well. That sounds lovely – perhaps I’ll give it a go. My kids love carrots and hummus! I will have to try this recipe, do you think it would work with tahini and parsley instead? Fantastic – yes of course! This looks super. And thank you for liking my Kentucky Bourbon Cake recipe. Your food is always so good. I am honored. Thanks so much! I’m glad you think so. Oh, I am anxious to try this one! I’d like to make it this weekend for my friends! Please do! I’m sure they’d love it! Oh, very nice.. There’s something about roasted carrots.. And hummus. And combined. Ah. Will try this one for the dinner party this weekend. We’ve got a few vegetarians coming! Hehe, indeed! I’m sure it’ll go down a treat! 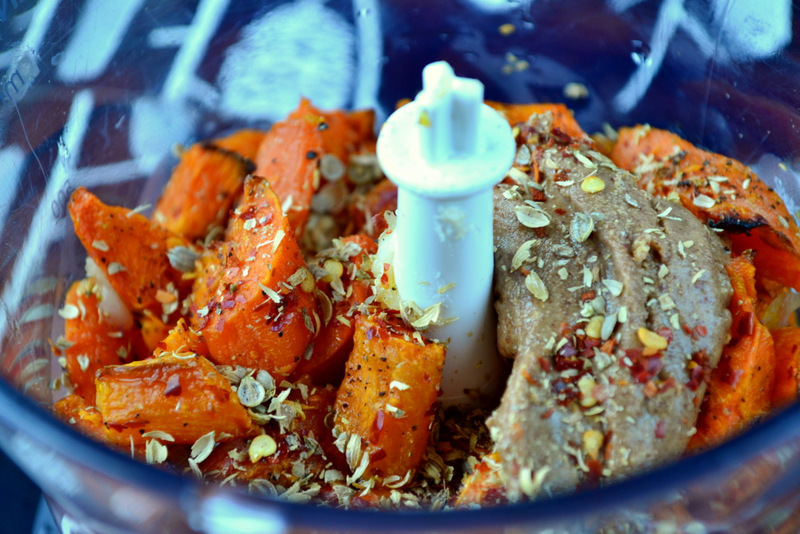 I love hummus and make it all the time but have never tried a carrot version. This looks absolutely delicious and am intrigued by the addition of peanut butter – will have to try it very soon! Oh you should – so tasty! Peanut butter is really just a sub for tahini – a delicious one at that!